Dr Ngwenya is Regional Director Africa of Intellecap, part of the Aavishkaar-Intellecap Group. He is responsible for aligning Intellecap's corporate strategy to successfully execute on the group charter of “Building business for the Next 3 Billion”, expand to new markets in Africa, and steer the company in the direction of realising its vision - of a world that is guided by fundamental principles of equity and sustainability at every level. 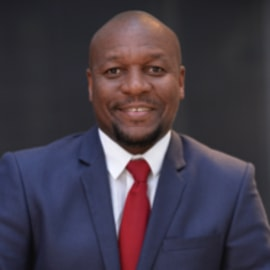 He plays a key role in strategic decision making across all initiatives and service lines of Intellecap in Africa and in leveraging market based solutions to connect the economic and development worlds of corporates and governments with low-income populations in emerging markets. Prior to joining Intellecap he held various positions in the financial services sectors and consultancy rising to the position of CFO and Managing Director. He has extensive and diverse experience ranging from international banking, strategy consulting, project management, corporate finance, and socio-economic development. He draws on this wealth of expertise to advise blue chip multinational corporations, international developmental organisations and governments to implement successful socio economic development projects and structure development financing solutions. Dr Ngwenya has formidable international investments and grants management skills having run and substantially grown development funds and assets under management in excess of $2 billion with annual investments of more than $100 million aimed at developmental financing in Africa. With his in-depth knowledge of socio-economic development, and successful record of programme implementation, he has stepped onto numerous stages and podiums to advise the private and public sectors on how to best structure to be attractive to potential investors. He has written and presented conference articles, appeared in various publications and featured on television and radio interviews discussing topical issues related to business, sustainable development and politics in Africa with media stations such as CNBC, BBC, CNN and SABC Africa. Dr Ngwenya holds a Doctorate in Law from the University of South Africa, an LLM in Public International Law from the University of London, an MSc Finance and MBA from Edinburgh and is a Chartered Corporate Secretary. He is a former Deputy Chairman of the Tshwane University of Technology Council in Pretoria; and a member of the Institute of directors. Former Board Examiner of the Chartered Institute of Secretaries in Corporate Governance written in 10 countries - in addition to being a Fellow Member of the institute. He served for several years as the public officer of various developmental funds and as an advisor   on Bilateral Investment Treaty policy development. Mthandazo has also been influential in advising the Southern African Development Community secretariat in Gaborone, Botswana on designing developmental programmes that can attract private sector co-funding opportunities to SADC.